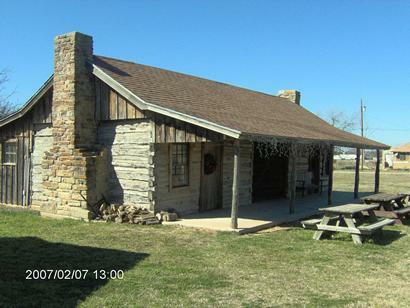 It was originally a relay station on the stagecoach route that ran from Weatherford to Palo Pinto. A Millsap post office opened in 1877. In 1880 the tracks of the Texas and Pacific Railway reached the area, and three small communities moved to take advantage of the railroad: Mineral City, Peck City, and the Millsap relay station. 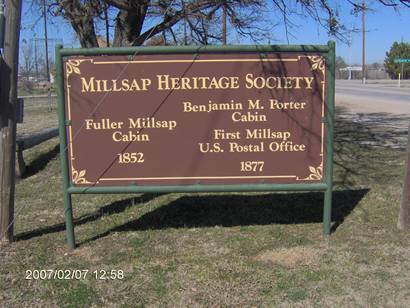 By the 1890s Millsap was serving area farmers as a retail and shipping point; within a decade the town had a bank, more than a dozen other businesses, three churches, a ten-grade educational institution called Millsap College, and a weekly newspaper, the Millsap News. The community population increased from an estimated 100 in 1890 to 800 in 1920. Between 1940 and 1970, however, it declined, reaching a low of 261 by 1968. It has since increased to it's current 353 after a brief surge to 485 in 1990. "I was born in Weatherford, was raised in Millsap and different branches of my family have been in this area since the mid 1800s. As a child I played in the �Old Millsap Cabin� on the �Old Millsap Place� when it was located on Grindstone Creek just off the present day Wilson Bend Road several miles outside of town. There are some old stories about Indian attacks associated with this place and there was a huge old oak tree in what was then its front yard where it was rumored that Fuller hung seven dead Indians killed in one of the fights. My brother and I, would hunt arrow heads there and imagine scenes of the battles when we would find one. 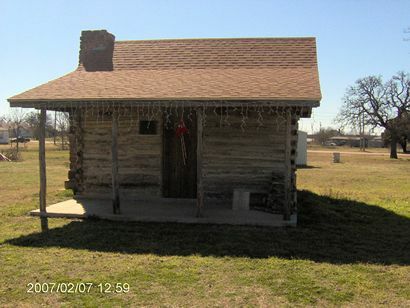 The cabin you show as the: �Fuller Millsap Cabin, c.1852, the first building in Millsap� has always been rumored to be the �Old Post Office� and was associated with Ben Porter but it was never even near Millsap. 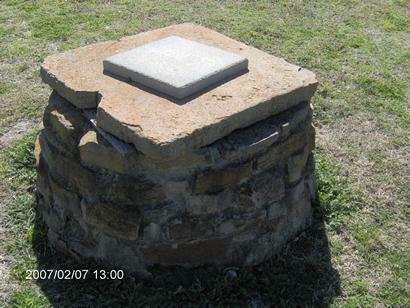 It was located on the old stage line between Millsap and Mineral Wells, and to my knowledge, its �post office� status was only a story. We could never figure out how people in that time would travel 7 or 8 miles outside of town just for mail. There are still a few of the old timers around here but most of them that I heard the stories from have long since passed away and it is getting harder and harder to even find anyone here that is from the area.